If you are seeking a bathroom with high design and elegance, this glass bath by Crystal Bath is a must. The simplicity of design leads way to an exquisite bath that is beautiful and distinctive. Crystal baths works to deliver “unprecedented style, luxury and durability”. The glass bath, formed from solid glass, comes in 5 different styles, Concave East & West, Lucid & Lucid Grande, and the Horizon, only differing in size. 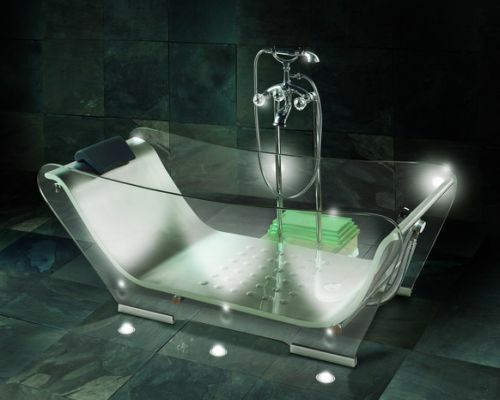 The Lucid glass bath can be sized to accommodate 2. Made out of glass and stainless steel, it appears to be floating majestically; almost waiting for you. The only flaw we can see is, the number of people who will want to try your bath out once they see it . This really looks to be one very comfortable bath. This entry was posted on Thursday, May 1st, 2008 by HDF and is filed under Bed & Bath. You can follow any responses to this entry through the RSS 2.0 feed. You can leave a comment.